Hire motorhomes in the historic county of East Lothians and see the beautiful county brimming with rolling countrysides and stunning coastlines! We’ve got a range of motorhome lenders in Musselburgh, Tranent, Prestonpans, Cockenzie and more! Just log in to your Camperbug account, select your dates of travel and scroll through a comprehensive list of motorhome lenders in East Lothians and across Scotland! Alternatively, if you own an idle motorhome, why not register it on Camperbug? Not only will you help a host of eager explorers savour beautiful Scotland, but you’ll also earn too! Set in southeastern Scotland, the historic county of East Lothian is a stunning region home to the eternal countryside and captivating coastlines. The region is home to an abundance of heritage, cultural and historical attractions and includes terrific museums, stunning galleries, crumbling castles and gothic churches! The East Lothians are home to four great museums plus two community museums which open up a great way to explore the rich history and heritage of the region. Captivatingly rural, the region charms with dramatic coastlines and charming fishing villages. 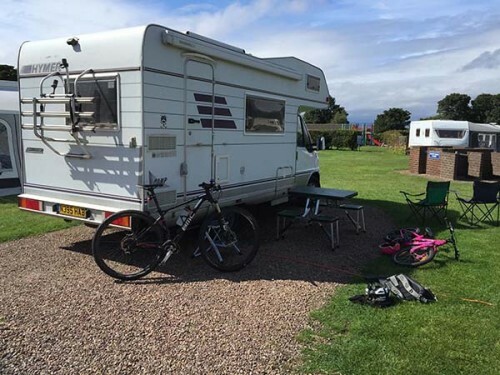 The ample space that makes up the East Lothian is fantastic for motorhome hires as you’ll have plenty of open spaces to camp in plus quaint towns and lovely seaside resorts to relax in! Take in the views of Dunbar Castle and the picturesque town of East Linton in your Camperbug motorhome hire! I am Hilda-eastlothian, hire me today! Our lovely 5 berth motorhome ‘Hilda’ is available for short breaks. If you fancy touring the country or Europe in relative comfort she’s your girl. She’s certainly done a few miles in her time but she’s reliable and still loves an adventure! (this is a German vehicle so is left hand drive) Kitchen with gas hob, fridge, pots, pans and utensils all provided. Toilet with sink and shower. Tv with built in DVD player (with a selection of DVD’s) Sleeps 5 comfortably. Bike rack on the back.